Quite possibly Chuck Norris’ best movie, Invasion USA is incredibly entertaining and fun. Completely disregard some of the more boring Chuck-fests you may have seen in the past, this one is a completely different beast and blows them all away! Former CIA agent Matt Hunter (The Chuckster) just wants to be left alone to live in his shack on the Florida bayou. But there’s a major wrinkle in his peaceful plan: the diabolical Rostov (Richard Lynch) is planning a full-scale Invasion of...you guessed it...the U.S.A! But before Rostov can achieve his evil ends, he must get one thing out of the way - Matt Hunter of course. Plus they have a history together. 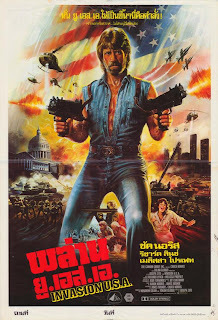 With the help of McGuire (Prophet), who looks like the way Britney Spears may have looked had she been in an 80’s Chuck Norris movie, Matt Hunter takes on more baddies than anyone before or since, but he’s tough. Very tough. THIS is the way action movies should be done. It has every possible ingredient for success: A tough, no-nonsense hero, an extremely nefarious villain, highly-charged action scenes, and plenty of surprises and humor. Also a large ingredient is the unabashed patriotism. No evil commies are going to come to our shores and take over. Not a chance. At least not while the surly Matt Hunter is in charge. 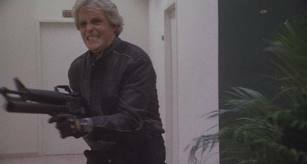 Fan favorite Richard Lynch is evil with aplomb. 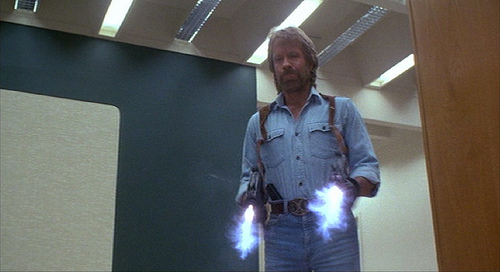 Chuck Norris is...well...you know who Chuck Norris is. Billy Drago has an early role here and it would have been cool to see more of him. That’s really the only quibble with this fine slab of entertainment. And even that is sort of unfair because of hindsight. Invasion U.S.A. is what happens when quality meets quantity. copious shooting, millions of bullets, endless ammo, tons of explosions and people being blown up by the house-load. The entire army is called in at the end. It was the 80’s, and action was huge. Why not make a HUGE action movie? Director Joseph Zito, known then for his slasher movie work, brings some of that mentality on board here, with violence, shocks and scares added into the mix. He later directed Red Scorpion, among other action flicks. The man knows his craft, that’s for sure. 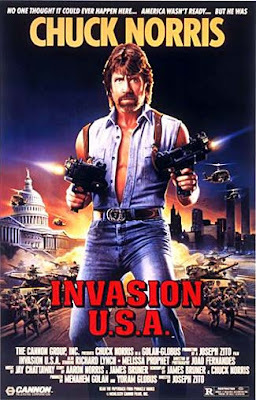 A crown jewel in the Cannon canon, Invasion U.S.A. is one of those movies that feels more like a ride than a film. It gets our highest marks. See it tonight! You know, perhaps I need a second viewing of Invasion USA, but aside from the pretty awesome final 20 minutes I thought the build up in this was pretty boring! The last 20 minutes were pretty epic, but there was a fair amount of action most of the movie. The scene when Lynch killed the drug dealers was pretty brutal! you say Chuck Norris. I say, bring it! Chuck Norris rules! The body count in this is insane! One of the pinnacles of 80's action for sure. Norris was on a roll in 85, I think 'Code of Silence' was one of his best films also. That film was remarkably brutal too, with all kinds of 'complex' elements to the plot involving corrupt and burned out cops on the mean streets of Chicago. The cliches were never better! Can't agree more! Invasion U.S.A. is a Chuck classic. We will definitely review Code Of Silence soon. My favorite Chuck Norris movie, and he made some pretty awesome movies. Another great movie is the sequel Avenging Force starring Michael Dudikoff. I have loved both movies since they were released, but only found out that Avenging Force is the sequel a few days ago. Totally agree with you Roger! This is Chuck's best! Avenging Force rocks too...Dudikoff brought his A-game to that.